"...a terrific new police procedural series." 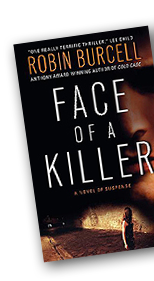 "Burcell, herself a former FBI-trained forensic artist, keeps her appealing heroine hopping just a step ahead of mortal peril in this intricately plotted page-turner." "Big story + great character + relentless suspense + expert insider knowledge = one really terrific thriller." "...a sure winner with fast-paced action and mounting suspense ." "Conspiracy buffs will enjoy this...saga, which gains authenticity from Burcell's FBI training"
"Burcell has created a masterwork of historical intrigue and cutting-edge forensic science. Suspenseful, shocking, and lightning-paced!" "Burcell's second novel offers plenty of action...variations on the Freemason conspiracy theory and a good deal of underground scrambling, Indiana Jones-style." "...a must-read for anyone who's obsessed with conspiracy theories." 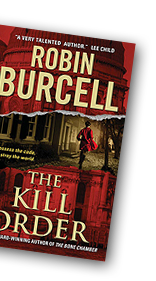 "Burcell's action-packed tale is a nail-biter from the first page." "...this suspenseful novel proves to be as frightening as it is enjoyable."